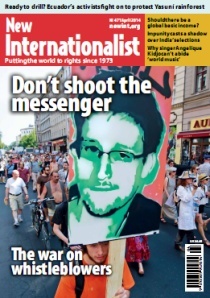 April 2014 - "The war on whistleblowers"
Is it a good idea to have a basic income? Are we ready to drill in Yasuní rainforest? A warning! Why does Angelique Kidjo hate “world music”? Can a language without a home survive? This page was last edited on 9 June 2014, at 20:43. This page has been accessed 9,974 times.